The Woodworking Show, Atlanta is over. Great fun. Wooden Cross scroll saw Pattern. 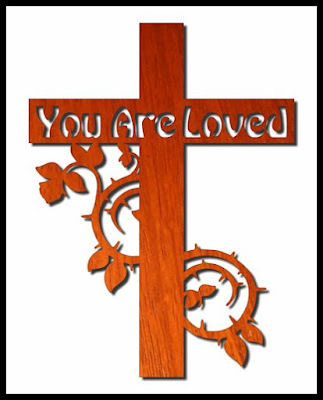 Large Wooden Cross. This project can be cut from any thickness of wood you prefer. I set the thickness to 3/4" in the pattern but use what you have available. The Woodworking Show, Atlanta is over for 2017. The attendance seemed pretty good to me. Saturday was especially busy. The live demonstrations were all well attended and I saw many shoppers with packages in their hands. I'm sure many people will also order the products on display online after the show. I hope the vendors did well because I saw how hard they worked to make the weekend happen. The Gwinnett Woodworkers Association booth was busy all weekend. A few of the guys were making custom jigsaw puzzles for the guests. Those were incredibly successful with smiles all over the guests faces. They took pictures at a photo booth then turned those pictures into framed jigsaw puzzles as the guests watched. That was just plain fun for everyone. Hans Meier entertained people with his compound cutting skills and caring personality. I stood back and watched Hans speak with the many children who stopped by the booth. He took the time to make sure every child walked away with a smile on their face. That was special. The Gwinnett Woodworkers booth was maned men and women from the club who all have a passion for the hobby. I watched in awe as these folks made things run like clockwork. This is one special group. I can't mention everyone but Bob Brokaw managed things like a well oiled machine. He took care of all the details of my stay. I always felt comfortable that everything was in good hands. Thank you Bob. Hans Meier made sure I stopped to take a breath every now and then. There were so many wonderful people stopping by to say hi that I had to be forced to take a break. I was just having too much fun to stop. I will leave people out if I keep mentioning names so I just want to say to everyone who made my stay at the show special, I love you guys. Such a special group of people. All of you should be very proud of what you have built. I can not explain the feeling of having some one stop by the booth and tell me they drove hours just to visit with me. As an online content producer I spend most of my time in front of a computer alone. I get to speak with people through email but it's just not the same as getting to shake a hand or get a hug. I enjoyed meeting everyone of you. Your words of encouragement and kindness were special and so much appreciated. I cannot put into words how much that meant to me. Thanks to each and everyone of you who stopped by. Peachtree Woodworking Supply Inc, is a sponsor of the Gwinnett Woodworker Association. It is a wonderful partnership. Peachtree is one of the leading suppliers of woodworkers in the U.S. David Hughes(President of Peachtree Woodworker Supply), made me feel welcome and appreciated. Thank you for the opportunity to attend such a great show. To everyone reading this click the link and check out what Peachtree Woodworkers Supply has to offer. It is a playground for woodworkers. I can't wait to get in their store tomorrow. Two of my best friends in the online community, Russ Claridy and Charles Dearing made the trip to the show. Russ was up from Florida and Charles came in from Texas. I have known these guys for years and this is the first time we have met in person. That was a highlight of my weekend. There were over 100 Woodworking YouTube content creators at the show. Saturday night everyone got together at a local restaurant and enjoyed each others company. Some of these folks have hundreds of thousands of subscribers and are very influential in the woodworking community. Some have only a handful of subscribers. It was cool to see that no mater what the channel size was everyone was treated as an equal. Lot's of good people just enjoying the hobby and making content for online viewers. We all got together after diner and took a group picture. That was lots of fun. Monday night I will be a presenter at the Gwinnett Woodworkers Association scroll saw group meeting. I'm really looking forward to that. My voice is a little shaky from a weekend of talking so hopefully I'll be able to speak. Maybe they would be better off if I just lost my voice. :). I'll try to keep things short at the meeting. I want to talk about a few things that I have been working on recently. I have a few giveaways and then we can spend a few minutes just talking shop. If you plan to attend bring your questions and I'll make up an answer. Hope to see you all there. Below are a few videos from my time at the show. I did not do as much coverage as I wanted because it was just so busy. The sights and sounds video will give you a small look at what it was like anyway. Introduction to Russ Claridy of Simply Wooden Creations at The Woodworking Show Atlanta. Introduction to Dave Gatton of Dave Gatton CNC at The Woodworking Show Atlanta. Sight and sounds from The Woodworking Show, Atlanta. , If you are reading this in the email newsletter you may not see the video. Click this link to watch it in your browser.